"Plump sugar-topped cookies that taste just like Mary Jane candies. I tone down the ginger and cloves for my toddlers." Mix together the brown sugar, peanut butter, butter, molasses and egg in a large bowl. In a medium bowl, sift together the flour, baking soda, ginger, cloves and salt. Add the dry ingredients to the wet ingredients and stir until well blended. For each cookie, shape a generous tablespoon of dough into a ball and roll in granulated sugar. Place the cookies 2 inches apart on an ungreased cookie sheet and bake for 10 minutes, or until just set. Transfer to a wire rack to cool. 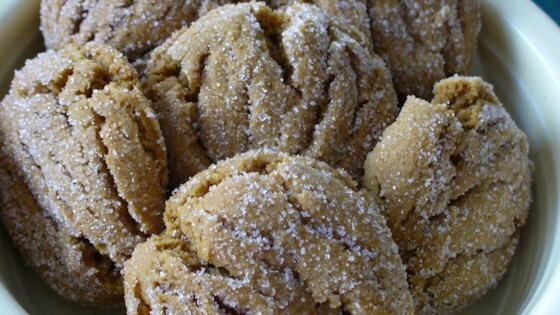 This is a great molasses cookie recipe! I rolled the cookies in cinnamon/sugar mixture. Everyone loved the spice. Yummy!! They were so good! The peanut and spices were a great combination, and the molasses accentuated the peanuty taste. I'd make them again in a heartbeat.